This is our newest rocker design, made from Mesquite and Walnut. 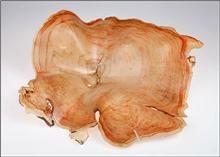 It made its first début at the San Angelo Texas Mesquite Festival and was the hit of the show. Everyone was talking about it. Scott has had this bent wood design in his head for over two years now. And yes it is named after me. I love this piece so much, that if I had the room it would be in the cabin right now, with me in it. I was blown away when I saw it complete and when I sat it, I just melted. It is so comfortable and fits me like a glove. This is a smaller more sleek looking rocker. 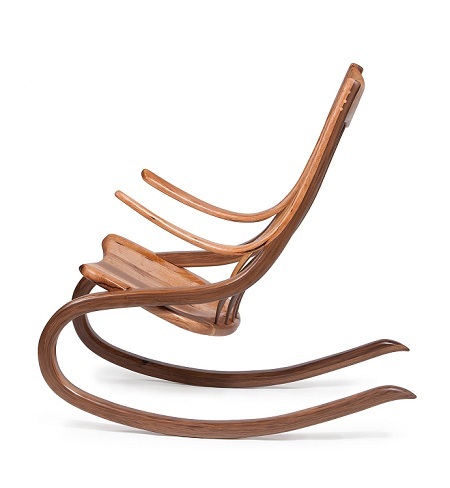 It doesn’t have all the sculpting as the Shangrila Rocker, but the bent wood design makes up for that. This was a very complicated rocker to make. 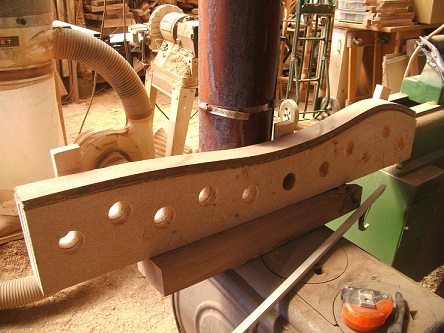 Each bent wood leg is all one piece, made from a 9ft piece of Walnut and they were quite difficult to put in the form. Below I have construction pictures of the process. Each leg sat in the form for a week. This laminated bent wood technique is very strong and will last through generations. Next a form had to be made to bend the arms just right to fit on the legs. The arms were made from mesquite and lay on top of the legs, so the wood contrast is quite striking. 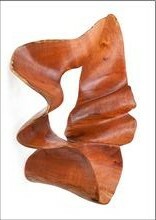 The seat, made from mesquite, looks like it hovers, but blends nicely into the legs with a strong joint. The headrest was also made from mesquite and flows into the section where the arms lay on top of the legs. The back lumbar supports are bent wood that have a flex to them. 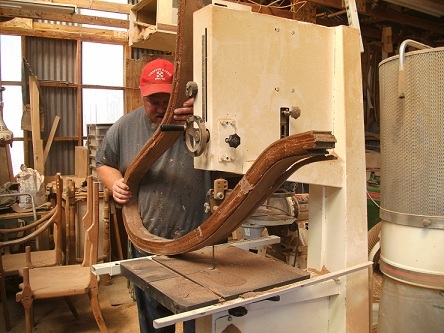 A special form was made to bend each one so that once assembled with the chair, they would fit right into the lower back and form to your back. They are glued into the seat, but left free to move in the headrest. Therefore flexing as you rock. This technique lent itself to the whole design of the rocker and worked beautifully. The core of the back support was made from walnut with mesquite on the face. 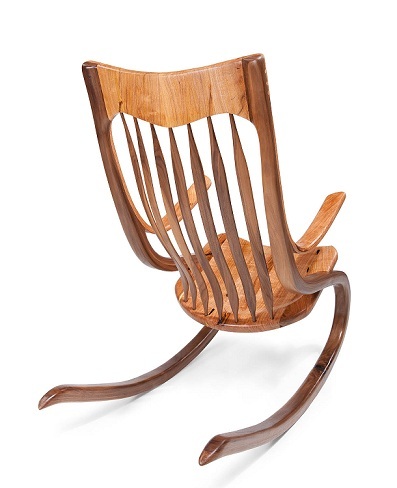 We think this rocker design is going to be a big hit. It defies the eye and makes you wonder how it was made. So artistically it is striking, but the comfort is like nothing you could imagine. Legs glued up in the form. This was quite a form. 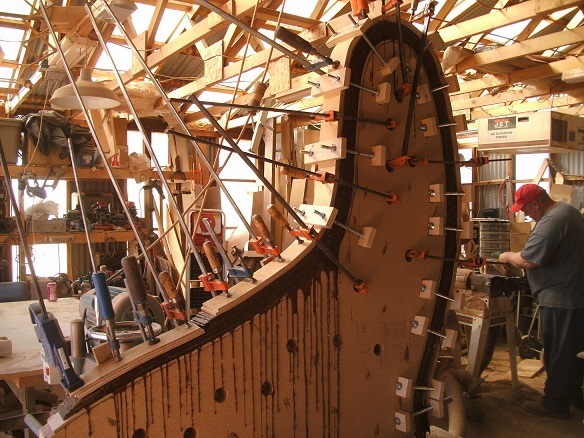 It had to be clamped down on saw horses, weighed a ton, used a lot of glue and Scott had to make a special setup to hold down the form in areas where clamps wouldn’t work. We have put in a request for more large clamps for Christmas. We just didn’t have enough for this beast. Now we need a storage building just for all the large forms we have accumulated. Here Scott is cutting the legs to size on the bandsaw before the arms are glued on. Arms are being glued on with the different form. Notice all the clamps used. Lumbar back support sitting in the form. All seven spindles had to be glued up separately and sat in the form for a day. Here the seat is being mocked in to find out where to carve. This seat was carved a little different than our others so that it would blend in better with this rocker style. 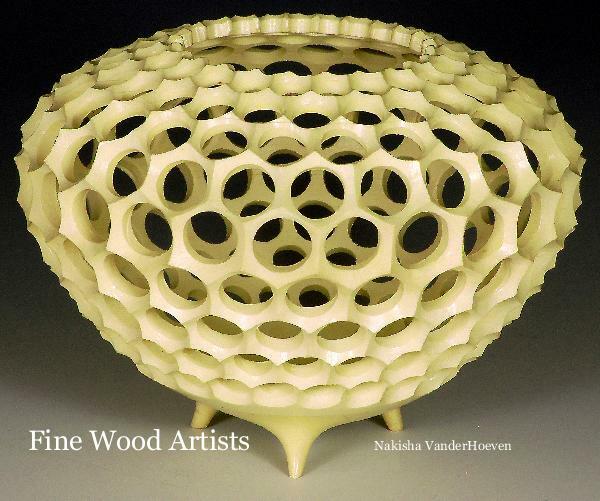 We have been featured in our first book, put out by Fine Wood Artists. 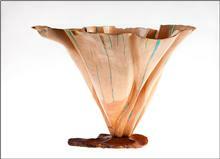 This all color book features over 30 other fine wood artists creating furniture, turned bowls and more. Our Shangrila Rocker made from mesquite was featured, along with a carved vessel “Surprise Sensation”. This is very exciting for us and we can’t wait till our copies arrive. We will have this book for sale in Hardback for $55.00 and Softback for $$43.00, plus shipping. If you would like to have one of these art collectors books please inquire. 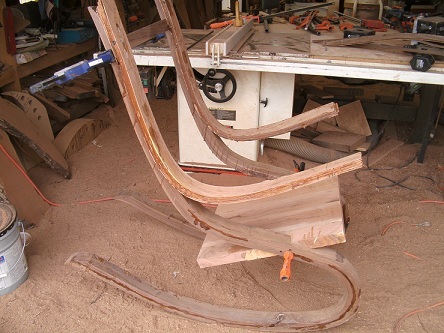 Received photos from our contacts in England of the mesquite pieces we sent over there. The one of the photographer taking a picture of the Shangrila Rocker is our favorite. The other photo of the carved mesquite vessels looks real good on the cabinet. Much better than the one we took ourselves of these pieces. We look forward to seeing the ribbon sculpture photo as well, since it their photo will show the detail of it much better than ours. You can see more detailed photos and information on the Shangrila rocker and the vessels in other posts on our blog. 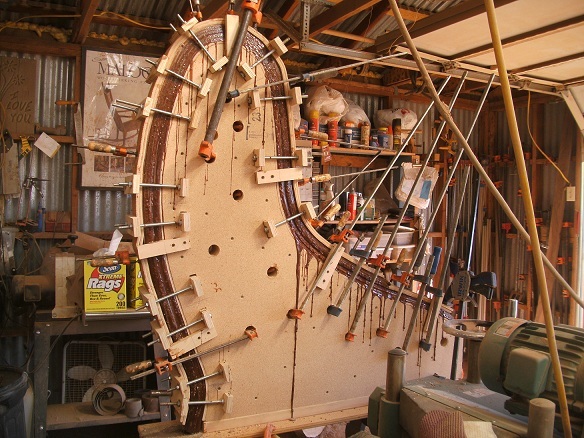 Right now we are getting ready for the Texas Mesquite Art Festival in San Angelo on April 15-17 www.texasmesquiteassn.org . 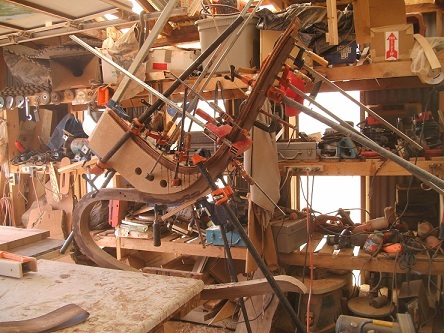 This is an all mesquite wood show where artists create anything from furniture, turned bowls, scrowl saw work to much more. We will be displaying a mesquite pedestal table set and a new bentwood rocker design made from mesquite and walnut, along with several new carved vessels and sculptures. We always look forward to these mesquite shows, since it is line one big happy family with the other artists and the customers come to buy and add to their mesquite art collections. Stay tuned for more photos of our new rocker in the coming weeks. You are currently browsing the Shangrilawoodworks's Blog blog archives for April, 2011.